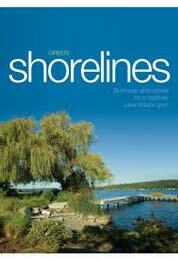 Green Shorelines: Bulkhead Alternatives for a Healthier Lake Washington offers lakeshore property owners a guide to understanding and implementing Green Shoreline practices and green dock designs, estimating costs and maintenance, and getting through the permitting process. The guidebook was produced by the City of Seattle, and the principles introduced in the guidebook apply to property owners on Lake Washington and Lake Sammamish. Sign up for a two day workshop on the Green Shores for Homes program May 31-June 1, 2017 at the University of Washington's Center for Urban Horticulture. Planners, contractors, landscape architects and others interested in learning more about this voluntary program that awards homeowners credits for creating "softer" shorelines should check it out at Green Shores for Homes Training Program. In a comprehensive Seattle Magazine article from December 2016, research scientists and shoreline residents discuss the ecological benefits of bulkhead removal: Seattle Seawalls no Longer a 'Shore Thing'. WRIA 8 has a Green Shorelines Blog to promote more salmon-friendly shorelines around Lakes Washington and Sammamish. The blog is aimed at local people working on green shorelines. It provides a platform for sharing case studies of shoreline projects, updates on policies and technical issues, and information you can use to communicate about improving salmon habitat along the shoreline. WRIA 8 welcomes your ideas for topics to cover, project case studies or updates. Contact Jason Mulvihill-Kuntz at 206-477-4780 or jason.mulvihill-kuntz@kingcounty.gov. Green shoreline designs incorporate natural features that offer several advantages over hard engineering approaches. Provide food and shelter for native fish and wildlife. Improve wading access to your shoreline. Increase safety by creating a gradual sloping shore. Frame views with native vegetation. There is a spectrum of green shoreline options that may be appropriate for lakeshore properties on Lake Washington and Lake Sammamish depending on the specific conditions on your property and your interests as the property owner. Design and photo: Ecco Design Inc.
Design and Photo: Marine Restoration and Construction, LLC. Which Shoreline Approach Would Work for My Property? This interactive decision tool is meant to give you, a lakeshore landowner, ideas for which green shoreline approach might work on your property. Since each site is unique, the results are not prescriptive, and you are encouraged to consult with a professional to develop an approach that will address your property concerns, improve the visual appeal of your property, and provide the greatest habitat benefit for native fish and wildlife. What Do I Need to Know About Permitting My Project? Planning to repair or replace your dock? Is your bulkhead failing? Do you want easier beach access? For shoreline property owners, knowing what permits are required, which design alternatives are right for your shoreline and dock, and who to call can seem confusing. Several different agencies have a role in regulating lakeshore activities, and most have websites and helpful staff trained to lead lakeside property owners through the process.